“Cliff the coyote” was safely tranquilized and relocated on Wednesday October 5, 2016. 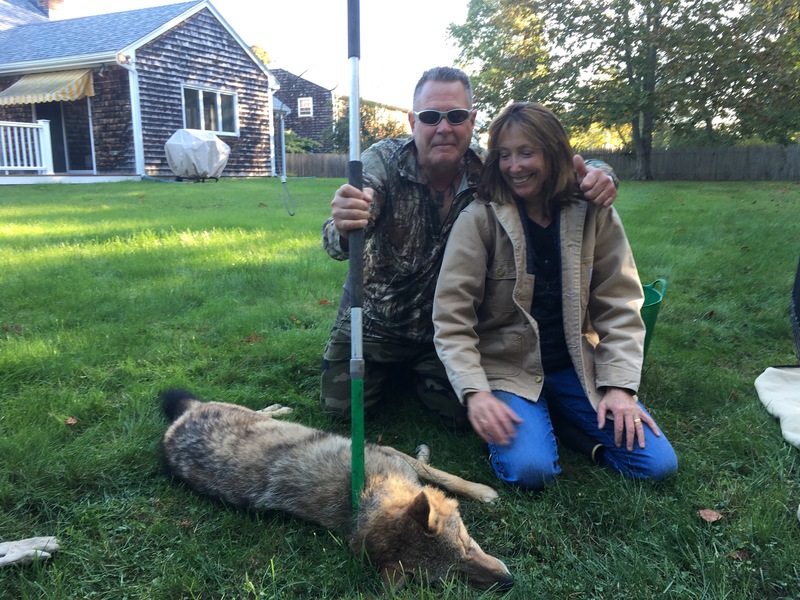 I am extremely proud of Narragansett Bay Coyote Study (NBCS) team-members Roland Belotti, Eli Mitchell, and Rodrigo Fernandez who helped capture him quickly and safely. We also thank Scott Marshall, State Veterinarian at DEM, and Ralph Pratt, D.V.M., Chief Veterinarian for NBCS, who assisted behind the scenes, and EPO Richard Browning from DEM. Slipping on a neck restraint before removing the collar. Photo: Rodrigo Fernandez (screen capture of documentary in preparation)/The Conservation Agency. 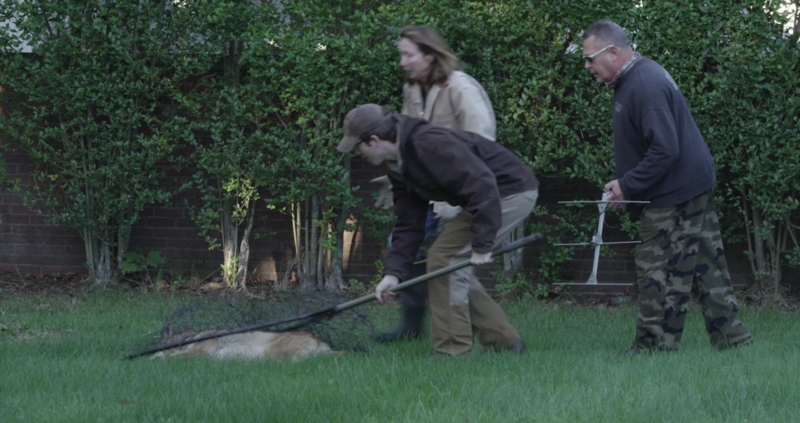 Coyotes are notoriously difficult to catch with a tranquilizer dart. The dart has to be launched from the rifle with very low power and flies relatively slowly through the air. This because it is important to hit the animal gently to avoid any injury. You want it to hit the coyote with about the power of a hand thrown dart. Coyotes are so quick they can see the flying dart coming and jump out of the way. Our NBCS team is well trained in “Safe Capture” techniques, nevertheless, we planned and practiced the operation over the past two weeks. We caught Cliff while he was dozing in the sun. After netting him and removing the collar he looked terrific: he was starting to grow his winter coat, and was one pound over his initial capture weight of 40 lbs. He had a small pink spot where the dart hit. Cliff’s collar is off and Numi Mitchell and Roland Belotti take a breath with a collarless sleeping coyote. Photo: Rodrigo Fernandez (screen capture of documentary in preparation)/The Conservation Agency. Cliff’s story is now famous and needs explanation. This past few weeks, Department of Environmental Management authorities and NBCS looked closely at the possibility of moving him to a zoo before the state decided to relocate him. The Director of Roger Williams Park Zoo, in Rhode Island, simply stated he could not take Cliff. They had space issues (no enclosure) and he was concerned that a wild coyote like Cliff would successfully adapt. 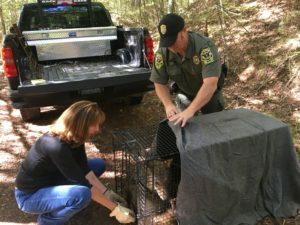 This was supported by coyote rehabbers that cautioned that coyotes do not adapt well to captivity if they are older than three months. 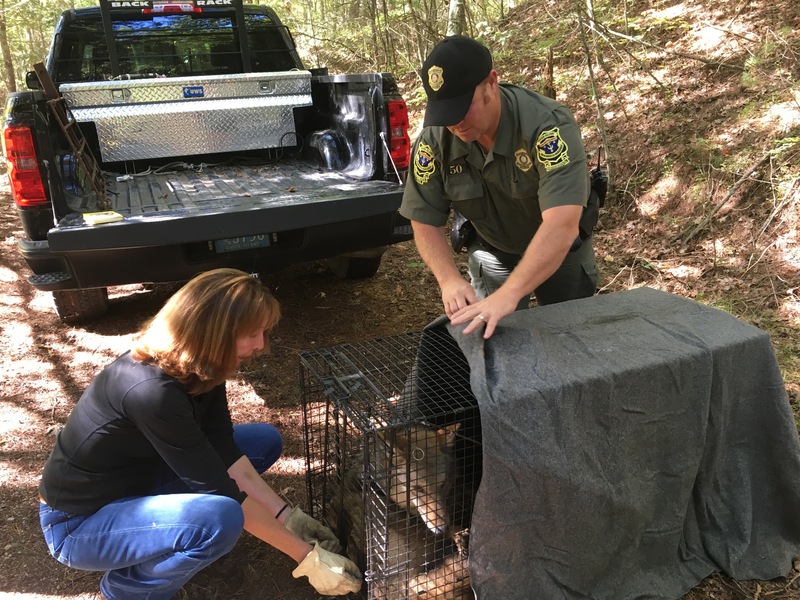 The Buttonwood Zoo Director, in Massachusetts, reiterated the concerns about coyotes adapting to captivity (they have experience with coyotes) and had a set of conditions that had to be met before they might take him. 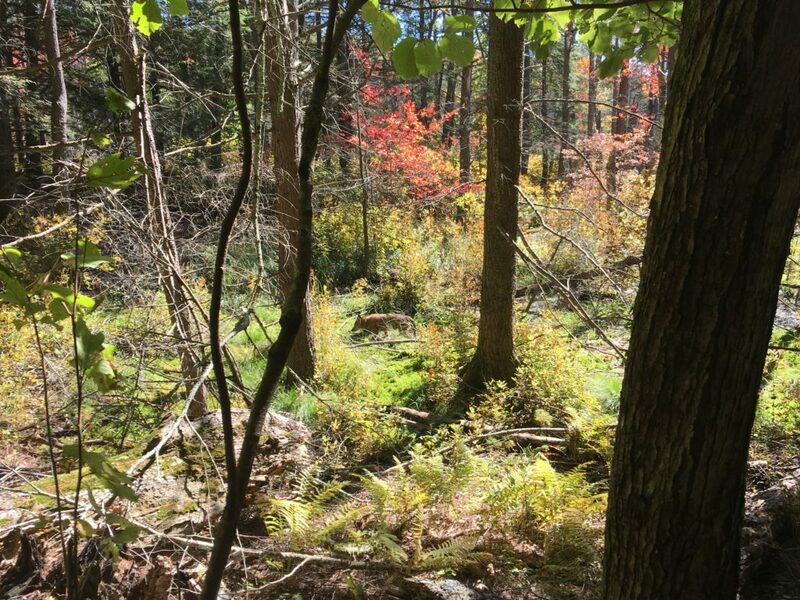 He needed to spend time in an interim facility in Rhode Island. After a period of time they would evaluate his behavior and decide if they would take him. Then he would be placed in a 30-day quarantine at Buttonwood. Sliding Cliff into transport cage. Photo: Rodrigo Fernandez (screen capture of documentary in preparation)/The Conservation Agency. DEM decided to relocate him to a remote section of Rhode Island. It was not our decision. But all considered we felt it was a better option that the uncertainty of a zoo. 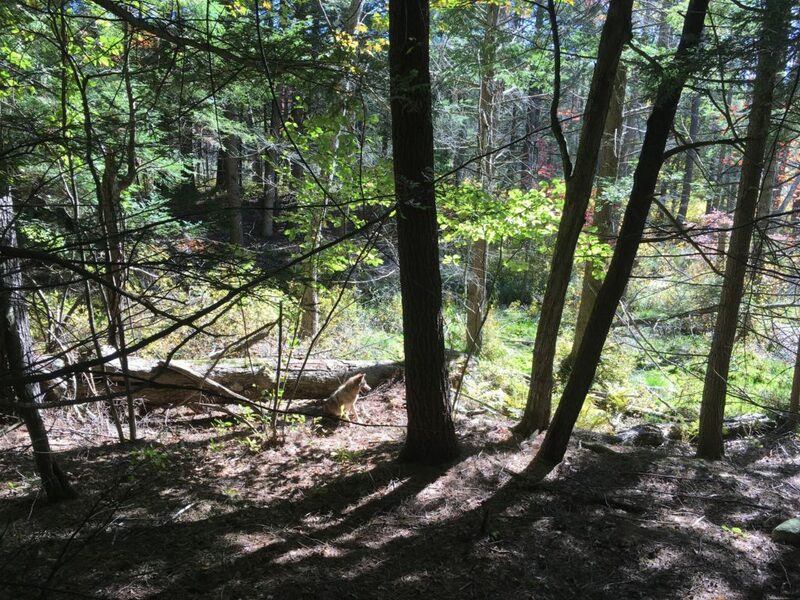 I think two separate stretches in small cages as well as the location changes would have been a huge stress for Cliff who usually rambles large distances each night. In addition, we could not find a legal interim facility to hold him. We also considered the following: Cliff is only a year-and-a-half old. He is not far from the age that many young coyotes naturally disperse from their natal pack. He knows how to hunt geese, deer, rabbits, mice, and woodchucks – he was not always a dumpster diver. He spent most nights hunting last winter; very little was obtained from people or dumpsters at that time. He also has a “beta” personality – he gets along with alphas and helps them out. 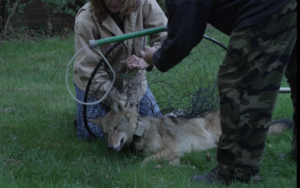 This may give him a better chance to assimilate with another pack than other coyotes might have. Last, some people have asked why we didn’t keep the collar on. We usually track coyotes for a year. Each collar has a radio remote which we can trigger if we want the collar to drop off early as well as a count-down timer which triggers the collar to drop off at 12 months automatically. Cliff was two months from a timed drop off. Over the past 10 months Cliff has show us many food subsidy sites that we can now, with increased awareness and legislation, clean up. We have watched him help his packs alphas (his mother and father) raise a litter of younger siblings who are now ready to disperse themselves. Further his celebrity has helped people to understand why feeding coyotes is both inhumane and unneighborly. 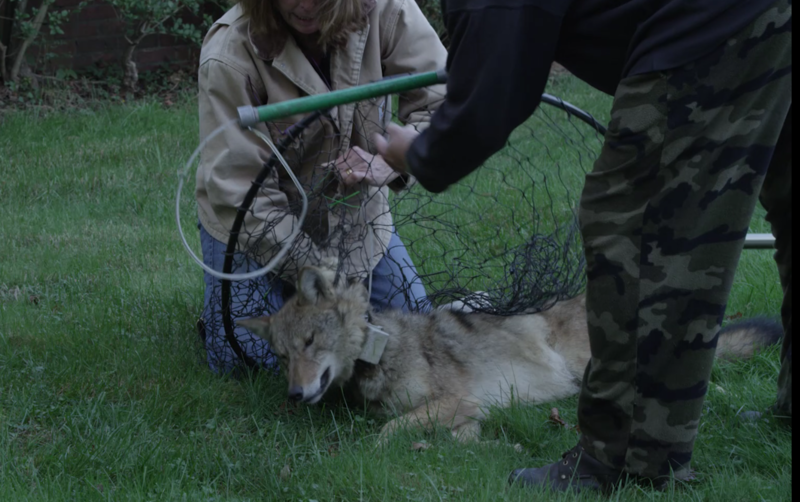 Our data from collared coyotes have shown us that food subsidies – large and small – from humans are what cause “coyote problems.” This helped NBCS develop a set of “passive management strategies” for coyotes that are not based on lethal control. Instead they are based on changing peoples’ behaviors and eliminating the food subsidies we provide. Cliff has done a lot for us and we wanted to give him a break. He deserves to find a new home, in peace, and we hope he does. To all of you who care about Cliff or supported the rescue campaign, thank you. Special thanks to John Florez, Newport City Councilman for his generosity and concern. NBCS will use any remaining funds to ramp up our education, outreach, and legislative efforts for sustainable, safe, coexistence.